For other uses, see GAF (disambiguation). For speakers with /ɡ/ as the main phoneme for ق, the name can be used for the letter when trying to explain a pronunciation/spelling of a word, whether the word is foreign or dialectal. گ is based on kāf with an additional line. It is rarely used in Arabic itself, but may be used to represent the sound /ɡ/ when writing other languages. It is frequently used in Persian, Pashto, Uyghur, Urdu and Kurdish and is one of four Perso-Arabic letters not found in Arabic. ڭ can also be used to represent /ɡ/ in Morocco, occidental Algeria and many Berber languages. ݢ is derived from a variant form (ک) of kāf with the addition of a dot. It is not used in the Arabic language itself, but is used in the Jawi script of Malay to represent a voiced velar stop /ɡ/. Unicode includes two forms on this letter: one based on the standard Arabic kāf, ك, and one based on the variant form ک. The latter is the preferred form. ࢴ is derived from a variant form (ك) of kāf with the addition of a dot below. It is not used in the Arabic language itself, but is used in the Pegon script of Indonesian languages to represent a voiced velar stop /ɡ/. This also used in Arwi alphabet. ڳ is derived from a variant form (ک) of kāf with the addition of a line and two dots. It is used in the Sindhi and Saraiki alphabets. 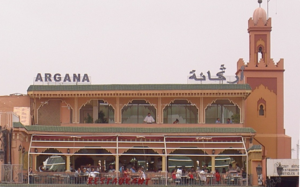 The Arabic signage for the Argana cafe in Marrakesh's Jemaa el-Fnaa features a prominent gaf with three dots. ݣ or ڭ is based on a variant form (ك) of kāf with the addition of three dots. It is used in western Algerian Arabic (elsewhere in Algeria, ڨ is used), in Moroccan Arabic (though Persian گ can also be used) and in many Berber languages to represent /ɡ/. Examples of its use include city names (such as Agadir أݣادير, also written: أغادير) and family names (such as El Guerrouj الݣروج, also written: الكروج). In Chechen on the Arabic character ࢰ is used to write a Кӏ (Kh). ڨ, a letter derived from qāf and used for [ɡ] in Tunisia and Algeria. ^ Jonatha Kew (2003). "Proposal to encode Jawi and Moroccan Arabic GAF characters" (PDF). ^ Roozbeh Pournader, Google (June 24, 2013). "Proposal to encode three Arabic characters for Arwi" (PDF).